This entry has the strange happenstance of being a part of at least 3 series of blog-posts. It is an addendum to a long-running series wherein I showcase my Doctor Strange (and assorted "6-Dimensions") articles of clothing. It is the last of this month's series of "gift-related" series of posts. And it is the beginning to a new series showcasing assorted ancillary "Artifacts". Every so often it’s nice to treat yourself to a little something-something (no... not "sump'n sump'n"! Get your minds outta the gutter). No one can get you the gift you really want better than you can yourself. Heck, that’s why God created gift-certificates. Well, while I will (probably far too often, to tell the truth) treat myself to a gift or three, inherently it’s something for my collection (and not me personally – because by now my collection has grown, acquired sentience and is an entity unto itself), still once in a blue-moon I will get something that is, ostensibly, for me. As long-time (and perhaps the occasional post-surfing) readers may recall, I long ago started a series of posts which showcased my Doctor Strange-themed “Mystic Garb” apparel – the first of which, among the many pieces, included both a Doctor Doom and a Doctor Strange baseball cap. That post can be found [HERE]. 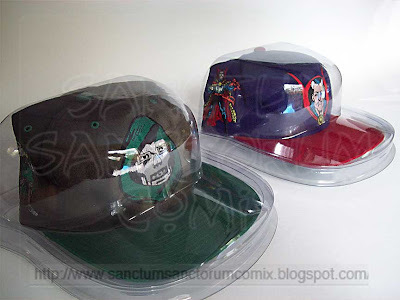 Well, after doing harm to the Doctor Doom cap (I wore it when I first got it – mistakenly thinking that I’d get another - and it paid the price for that folly) I vowed never to wear the Doctor Strange cap - which, as far as I can tell could be an Officially produced “One-of-a-Kind” item, since it is merely an official product sample for a line that had ceased production before that design would be mass produced. So, while I can’t wear one 1-of-a-kind Doctor Strange cap, that doesn’t mean that I couldn’t wear a 2nd “1-of-a-kind” Doctor Strange cap. 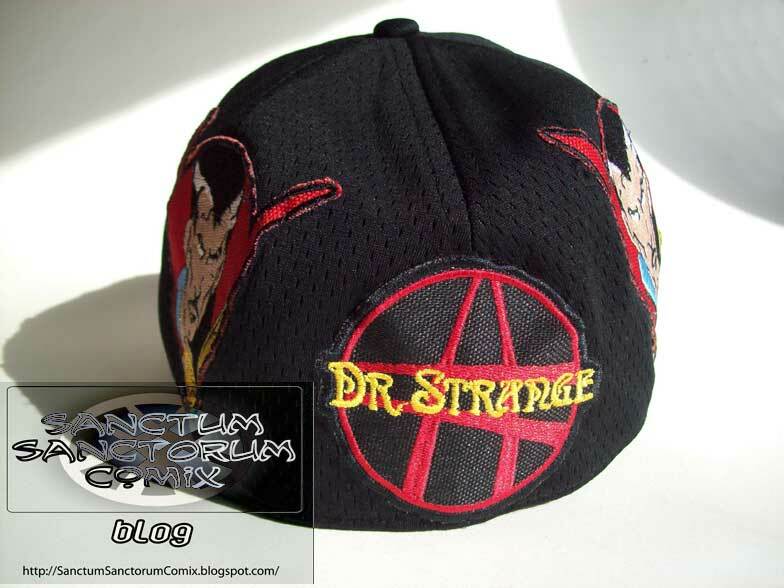 And thus, I had sewed onto a new baseball cap, assorted Doctor Strange PATCHES, to make a special edition just for me. I’m not much of a baseball cap wearer. I have one for the Pittsburgh Pirates, but that’s primarily for the big golden “P” in the front. “P” is for PTOR. I couldn’t care less about any particular team. Not since I was a kid (and my two faves were the NY Mets – and, coincidentally, the PA Pirates). But I wanted a hat that spoke of what I like – what type of mojo works for me. Well, this, while a bit garish, is it. The third eye sits atop my brow. All without serious meditation or soul-searching. Doctor Strange heads/busts on either side & the made-for-TV movie logo at the back. While I do wish that the heads were smaller, their placement - set further back - and the curve of the cloak’s high-collar frame the logo in the back quite well. 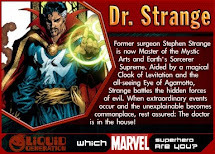 With the Eye of Agamotto up front, twin “Doctor Strange” heads set back on either side, and the “Dr. 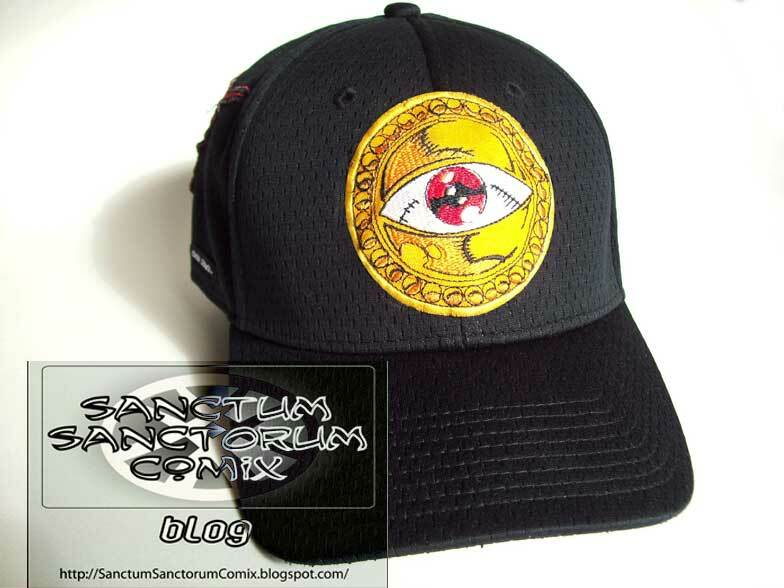 Strange” logo from the 1970’s TV movie around back, this hat shows that I've always got Doctor Strange "on my mind". Incidentally, I am nearly 100% sure that the maker of these patches (a seller from Argentina) used one of MY uploaded pics of the title screen for the movie logo as visual data for the patch-making machine; which makes this patch yet another of my little unintentional offerings to the world-at-large (as I detailed in my most previous post [HERE]). And thus, I end this month’s “gift-giving”-themed series of posts. But while this series ends with this post, this post also begins a new series of posts which will feature assorted Ancillary Artifacts; patches, buttons and assorted bling. So come back in a few days for the beginning of that. 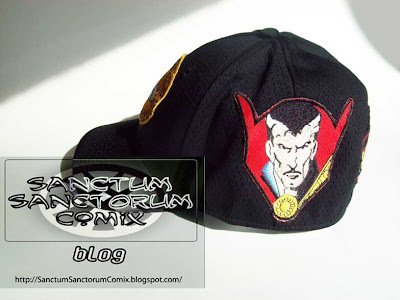 By the way, this post, as do all new addendums in the “Mystic Garb” Dr. Strange-themed series, will be reproduced as an update in the appropriate entry (in this case, the first; "Caps & Ties"). In keeping with the thru-line for this month’s blog posts, of showcasing gifts (either from me to you, or from others to me) this entry will reveal secret presents that I (sorta) helped deliver to everyone who reads many of Marvel’s mystical comics over the past decade or so. Now, bear in mind, none of these are anything more than minor, humble offerings. Still, while being hardly worth mentioning, I needed something in the vein of “gifts” for the blog post, so here we are. Every now and again, I have – either via intentional communication, or others’ “referencing” of my images – influenced stories and artwork from a few writers & artists at mighty Marvel. Then, those influential tidbits would be presented therein the creator’s work and thus would I be a silent gifter (a “Secret Sanctum” as it were… get it?... “Secret Santa : Secret Sanctum”?... uh… nevermind…) to comics readers. While this has happened on more occasions (that I am either omitting intentionally, have forgotten or am unaware) I shall reveal three such instances – each with their own level of success. The first such incident occurred back in late-2005 or early-2006, when after purchasing unpublished comic scripts (in particular issues of “What If?” which feature Doctor Strange, of course) from famed author Steve Englehart, we had several more email correspondences, wherein he was revealing his then-next work for Marvel; ‘STRANGE WESTERNS; starring the BLACK RIDER’ one-shot which was part of Marvel’s then-resurgence attempt for their western characters. 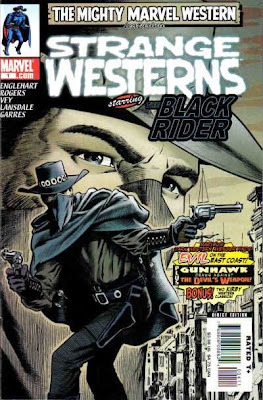 Mr. Englehart was telling me of how since the tale dealt with the “before he was Ancient” Ancient One, teaming up with the Black Rider (and subsequently other era-appropriate heroes) that he wanted to form them into an ersatz 1800’s-era team of Avengers. I pointed out, that if the Ancient One were to be a part of it, it would make more sense that he take the “Doctor Strange” role and have an 1800’s era team of DEFENDERS. That idea struck him as a much better angle to pursue, and if the one-shot were picked up for further publication options (mini-series’, long-term series’, and/or specials, etc…) that my angle would be the way he would like to proceed. The next occasion that I shall share met with far more success. 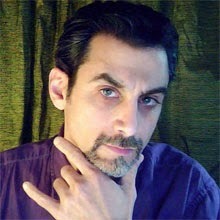 I truly have NO idea how I began corresponding with author/artist/designer David Sexton back in late-2006 or early-2007. Perhaps an exchange on a message board that led to further email exchanges? Suffice it to say that somehow, we did. 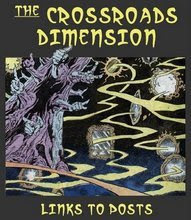 In those conversations, Mr. Sexton told of his large-scale project for Marvel which was a one-shot and mini-series called ‘Marvel Tarot’, and how it was to also feature a newly designed tarot consisting of Marvel’s mystic heroes. The basic premise being that Ian McNee (last seen in a back-up tale in ‘Marvel Fanfare’ # 6) would have a tarot deck that would portray all these various Marvel mystics. I suggested that why not just have him use such a deck that already existed? 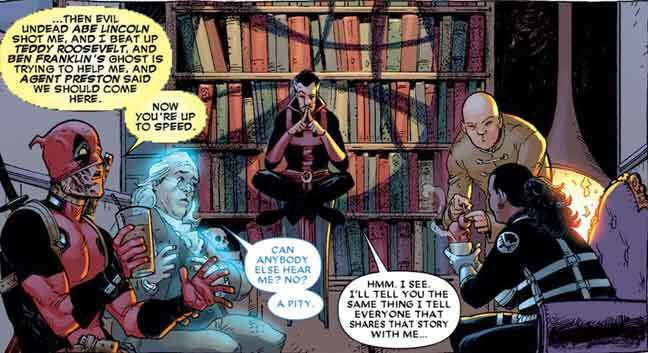 Doctor Strange had just such an enchanted deck which he used to choose “Secret Defenders” in the title of the same name. Mr. Sexton thought that was a fabulous idea and a wonderful stroke of serendipity, and thus he proceeded with that concept for the final publications. However, he probably didn’t know that Marvel has a “sliding timeline” (that all the events from Fantastic Four # 1 until “now” occurred in a 10 to 12 year span of time – vs – the actual years of publication) and had Ian McNee state, in comic, that he had that deck of cards in his possession for 10 YEARS – which is how long it had been since ‘Secret Defenders’ was published. Now, of course, it’s a minor quibble, and one that maybe no one but me noticed, but it caused the nerd-centric portion of my brain (read: 99.999%) to stop dead. Even if he didn’t know, an “editor” would catch it. I was not wanting to be a pest or seem like a fanboy, and so kept my correspondence to a minimum. Still, it was a cool idea, which kept a piece of valuable mystical eclectica in the canonical zeitgeist – for a short while, at least. Sadly, while ‘Marvel Tarot’ was a success in every aspect of its rejuvenation of the various magical properties that Marvel has in its catalogue, somehow it, and all its tantalizing teases of projects and storylines to come, was quickly forgotten. But then there are times when you can influence someone’s work without having any idea that you are doing so. This next, and most recent incident occurred without my awareness – until I opened the pages of the comic in question. If you were to do an internet search for images of Doctor Strange’s Sanctum Window, you’d most likely come across any number of my own uploaded images at or near the top (as I’ve uploaded several for this very blog, either any of my assorted illustrations of same, my avatar which I use for “gravatar” and other message board ID, or even the tiny favicon that is used and visible next to the URL for the blog). 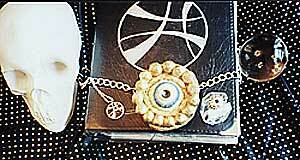 Now, look at the top of the side-column in my blog, you’ll see an old pic of a leather bound book with the “Window sigil” emblazoned on it, sitting on a table next to a skull, crystal orb, an ornate “Eye of Agamotto” and some custom-made jewelry; including a ring and a medallion with the same window sigil on them. The sigil is how I’ve drawn it for decades. (In fact that photo was taken in the mid 1990’s and the book itself was crafted in the late 1980’s.) As far as I can recall, no one has drawn it quite exactly that way, although obviously there have been very similar variations – as each artist has his or her own version. I, too, have other variations that I use – depending on the usage – but for a stand-alone graphic image, that’s the way I’ve tended to roll. Well, imagine my shock and surprise when I opened up both ‘Deadpool’ “NOW” # 2 & 3 and see my drawing of the window in the comic. Well, not MY drawing, but artist Tony Moore’s reproduction of it as a shadow on the bookcase behind Doctor Strange. He did an internet search for Doctor Strange's Sanctum Sanctorum Window and saw one of my pics. But, for any naysayers, I will –through the magic of internet animation – show you that the two designs line up perfectly. And there ya go… you’re welcome. OK, fine… as I said at the onset, neither of these are giant event-changing ideas, like giving Wolverine bone claws and naming him after the bullying father of his childhood friend (ohhhh…. 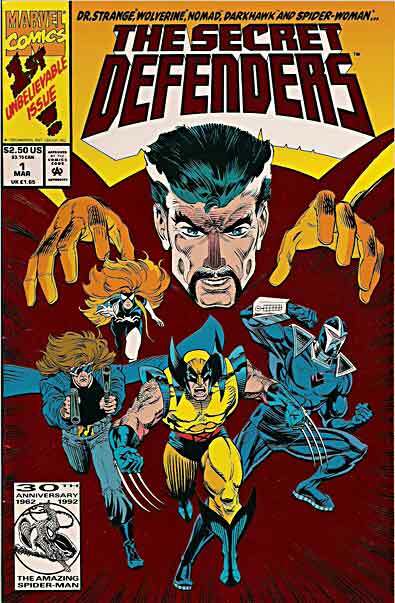 The whole thing makes my head hurt) – or that Professor X had a secret third team of X-Men that he sacrificed trying to save the original team before he would then recruit yet another (ugh… who thought of THAT? 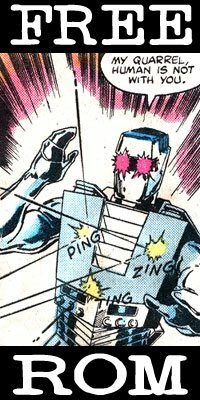 )…uh… or that Iron Man would have ALWAYS been Kang’s traitorous mind-thrall who’d then die off and his teen-age self would come to the present to take over the role (WTF?!? )… or that the young-boy Stephen Strange would be tormented by demons sent to him by a jealous Baron Mordo, since the Ancient One had said that the boy was destined to be “the chosen one” (GAH!!! 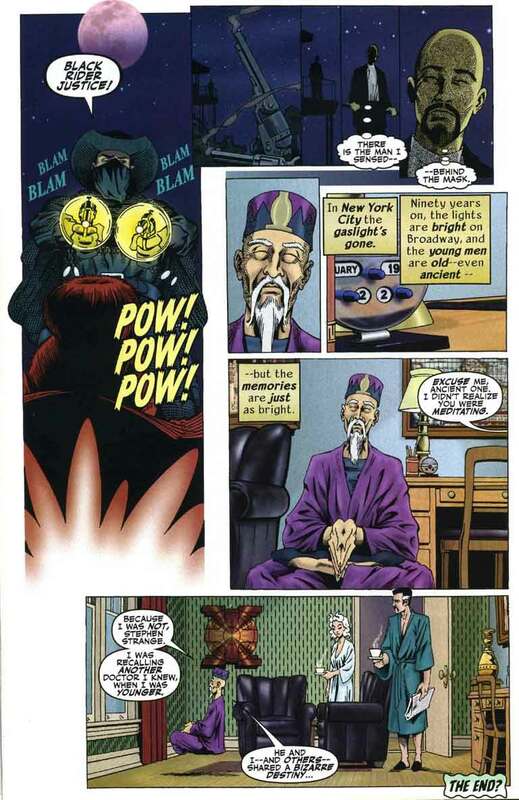 )… or that WONG would be a pupil of the Ancient One too and be the one to call upon the Vishanti while Strange was a bumbling idiot (AARGH!!! )… y’know what? MY little contributions are BETTER than those because, while tiny and innocuous, they helped BUILD upon the stories and didn’t destroy, derail or degrade the properties. Today, April 22nd is EARTH DAY and Friday, April 26th is ARBOR DAY, the one-two punch of "the GREEN" fighting back against a world of steel, sawdust and soot. Although, that might be the wrong metaphor for the spirit of the two days... which are less about battling against the oppressors of nature and more about giving back to the planet - giving a gift of sorts - to everyone - now and in the future. MAN-THING, a creature of the swampy Florida Everglades is the keeper and guardian of the Nexus of All Realities, and as such, the perfect spokesman for these "holidays". So, please listen to his message of Ecological Peace. SILLY people... did you really expect him to SAY anything? Man-Thing is MUTE! Anyway, his message was IMPLIED. He is an EMPATH. You need to FEEL his meaning. He would have shed a single tear like the Indian on the side of road in those old anti-pollution commercials, but Monsters don't cry (it must be the moisture of the swamp). This post is in keeping with this month's theme of gift-giving (so obviously, more gift-themed posts are to come). Approximately 1 foot tall, this ADORABLE plush Man-Thing was a gift to me Christmas of 2007 by my good friend (and fellow Strangeophile) Howard Hallis. 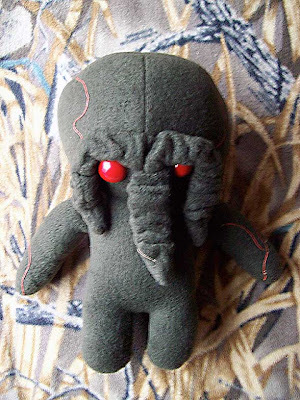 He commissioned it to be made exclusively for me from "Creeplings", a wonderful craftswoman's vision of darker shades of cute. Manny came with a special personalized certificate (a nicely laminated, die-cut tag with my name as the owner and Howard's as the commission-er) and oodles of cuddly charm. BIRTHDAY GIFTS... from ME to YOU! - From the PAST - for the FUTURE! It’s my birthday once again (dang, this past year went fast) and I thought I’d take the opportunity to present some gifts – TO YOU, my readers (and assorted drifters on the interwebs)! I’ve done this sort of thing before; gifting assorted electronic virtual-goodness from within blog entries (there was the animated gifs of characters [HERE], the audio play of Doctor Strange vs Nightmare (from a 1990’s phone card) [HERE], another audio-play of Dr. Strange and the Defenders for the Hulk’s birthday party [HERE] (and maybe one or two others). Well, in those instances, the "products" didn’t originate from me. I was merely passing on “Strange” rarities that I knew no one would have access to, unless they were - like me - crazy, obsessive/compulsive, completist, collector-monkeys. However, this time, I will share some electronic creations of my own! Waaaay back when I first started using a computer in my daily life (no longer just using one to play video games [like DOOM and/or DESCENT] and type up stupid banners), I taught myself how to make animated gifs, animated cursors and animated icons for my old PC. Well, since becoming a MAC guy, I fell out of the practice and only every now and again tell myself that "one day, when I have time, I'll make some more cool animated cursors and stuff – including some for the Mac". OK, so that hasn’t happened. Not that I can’t, the software keeps progressing and becoming easier while at the same time more flashy and professional-looking. But those who have been following this blog for any length of time know – time is not my friend. I’m always full up with daily projects, freelance artwork, life emergencies and assorted shenanigans – all on top of my day job. Sadly, even when THESE items were created, things were only slightly better and while I had time for smaller projects like these (and others which I will share VERY soon) I lacked the time for other, grander projects. For instance: I was EXTREMELY close to being the FIRST Doctor Strange blogger – heck, maybe one of the first COMICS bloggers – having arranged to purchase domain names and seeking out the best deals for internet web-hosting, circa 1997. I had everything ready – but time (as I was newly married, relocated and at a new job – and with a crappy dial-up connection). Now, before you accuse me of being some senile old codger, whose forgotten the point of his tale (ya, pesky kids! ), the reason I am telling that little tangential aside is that these items that I am presenting now were designed FOR that aborted website. Back in the nascent days of the internet, it wasn’t unknown to come across a website that had its own cursors which would appear in the place of your own standard “arrow-pointer” cursor. Usually it was some design scheme that had some kind of theme with the site, and so… since mine was to be SANCTUM SANCTORUM COMIX (yeah, the name has always been the same – it was also supposed to be the name of the comic shoppe that I was going to open at the same time [but that’s another story])… obviously, the cursors and icons were to be Doctor Strange related. - I was also, at that time, about to work on an Agamotto (caterpillar form) icon, but only managed to complete his Magic Hookah (animated cursor) which I’ll include as a bonus (for all the ‘heads’ out there)! Let DOCTOR STRANGE point the way around your computer! Let the EYE of AGAMOTTO peer into the darkest corners of your harddrive! Pass through the WINDOW SIGIL to Web-Dimensions Beyond! Let MAN-THING... er... kinda freak you out a little! Let AGAMOTTO's Hookah...ah... uh... what was I talking about? These were created for a system using Windows’95 and still work on a new system using Windows7, so you shouldn’t have a problem. Download the file and follow the “READ ME” instructions for proper installation. I’ll also paste the README info here as well. - First, save this file somewhere you'll remember. - THEN...go to your "START" button and go to your "CONTROL PANEL", then choose "MOUSE", then "POINTERS". - You'll see a scrolling list of cursors and their descriptions. We're essentially only concerned with a few: "normal select", "working in background", "busy" and "link select" pointers. - Each cursor should be used for a different purpose. *The Man-Thing images can also be used as "working in background" and "busy" so that the regular Man-Thing is "working" and the black Manny with glowing eyes is "busy". Or... the Hookah can be used the same way. "Hookah1" is "working" and "Hookah2" is "busy" - so that when it blinks from one to the other looks like it's being used. - Find where you put this file. - Select the appropriate cursor to match the purpose of the one you're replacing. LMK if you can or can not make it work. ps: just a note: when using the DOC pointer/cursor you must remember that the upper LEFT side is the default pointer area. Just look at the two "points" on his cowl. The one on the LEFT of the screen is where it "points". As an added bit of nerdity, you can select to have your cursors leave “trails” (you can select this is “pointer options”). So it looks like Doc is casting the Illusions of Ikonn to make duplicates of himself, which quickly blink out of existence. All icons/cursors/artwork/designs copyright 1997-2013 ~P~ / PTOR / SanctumSanctorumComix / MidnightImages / CrazyDiamondEntertainment. Doctor Strange copyright Marvel Entertainment..
Now, if you'll excuse me, I have an Ice-Box Cake to enjoy! You can't digitize that!